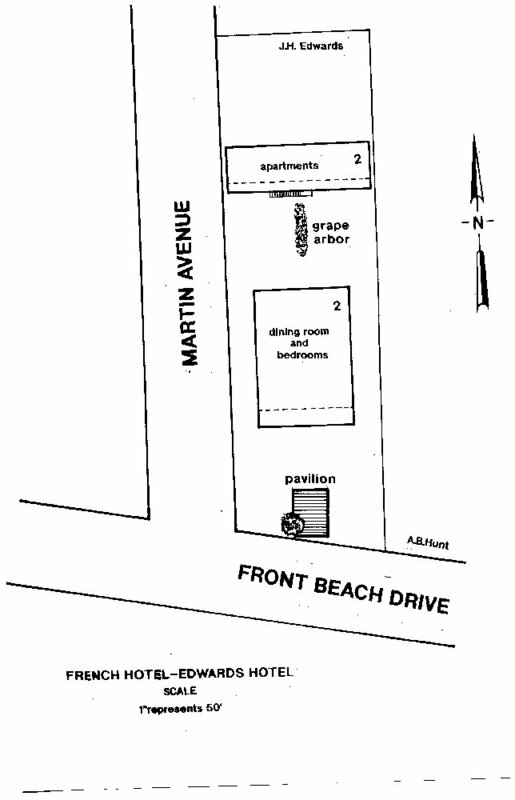 The French Hotel was located at Front Beach Drive and the east side of Martin Avenue comprising Lots 4 and 5 of the Austin Tract. The hotel grounds comprised approximately .60 acres. In later years, the French Hotel-Edwards House consisted of two buildings. The primary structure was a front gable, two-story, wood frame house with an undercut gallery. It faced the Bay of Biloxi near the beach front. 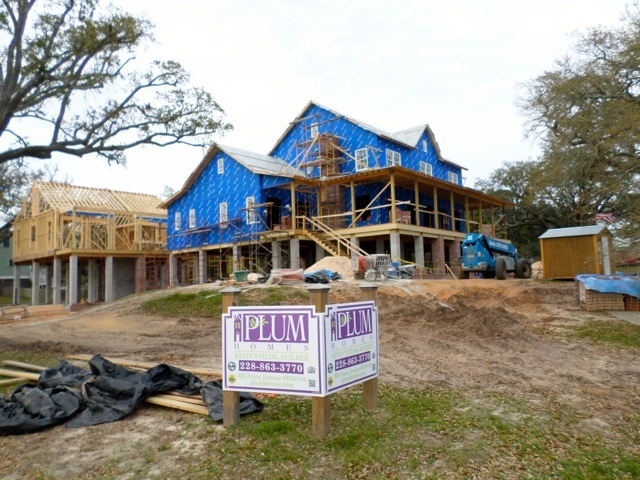 The original house was a five-room, Creole cottage of wood frame construction. Four doric pillars supported a hip roof, and two gabled dormers which featured six-over-six double-hung windows. The simple entablature consisted of a sinuousoidal patterned frieze. Multi-light French doors and windows graced the facade. A simple wooden balustrade surrounded the three-bay undercut gallery. 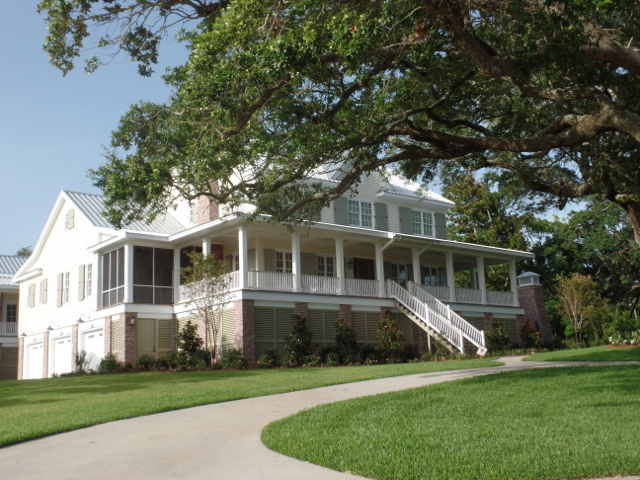 In 1927, The Edwards Family added a second story to the Creole cottage, and also increased the area of the structure to about 7000 square-feet. The dining room had the capacity to seat three-hundred people. A 600 square-foot, oak shaded pavilion sat near the beach. At the rear of the Edward House lot, there was a two-story, wood frame structure. It may have had a hip roof with an undercut gallery. The building consisted of twelve bedrooms, six upstairs and six on the ground floor. The rooms were approximately 14 x 20 feet. They were simply furnished with a four poster Nunn bed, wash basin, and picture. The bathroom and shower were located on the ground floor. When the Keesler Air Force base boom began in the early 1940s, this edifice was converted to an apartment building to ease the housing shortage in the area. A grape arbor was located near the stairway south of the building. 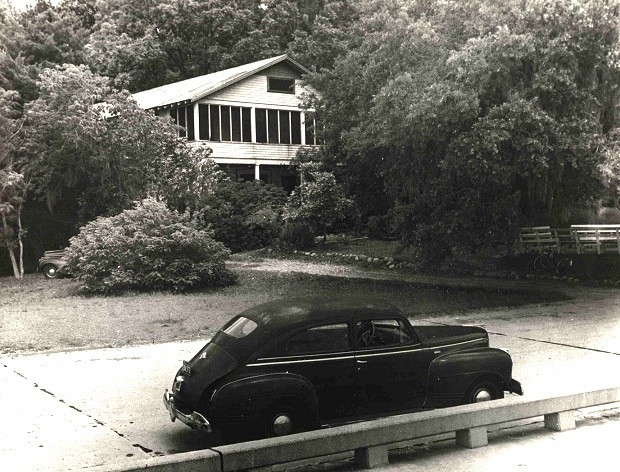 It and the pavilion were destroyed in the September 1947 Hurricane. In 1896, the French Hotel was founded by two French immigrants, Antoine and Marie Gouaux Bertuccini (1863-1930). Antoine Bertuccini (1844-1921) was probably born at Sisco on the Mediterranean island of Corsica. His parents may have been Paul Bertuccini and Marie Orsouie. Antoine Bertuccini immigrated to the United States in 1870 probably settling at New Orleans. Marie Gouax immigrated from France or Corsica circa 1884, the same year that Antoine's younger brother, Jacques Bertuccini (1854-1943), immigrated to the United States. Her nephew, Dr. Frank T. Gouax, was the health officer at Lafourche Parish, Louisiana, and would visit his aunt at Ocean Springs occaisionally. The Bertuccinis had five children. The first four, Agnes Bertuccini (1889-1906), Paul T. Bertuccini (1893-1949), Sadie (b. 1895), and Louis Bertuccini (b. 1897), were born at Napoleonville, Louisisana. Only Mary Felicite (b. 1900) was born at Ocean Springs. Paul T. Bertuccini married Hazel Cavanaugh of Biloxi in 1915. Under the Bertuccinis' management, the French Hotel catered to French speaking visitors from New Orleans and rice and sugar planters from South Louisiana. They came to Ocean Springs in the summer months to enjoy salt water bathing, cool breezes off the bay, and the medicinal waters which made the city famous. There was a 750-foot pier in front of the hotel. In 1904, a furnished room at the French Hotel rented for $3.00 per month. [Edwards family members in this image are: Ethel L. Schubert (1900-1991); Cecelia Schubert Brandt (1897-1989); Edgar Wallace Edwards (1927-1996); Donald F. Edwards (1924-1982); James H. Edwards Jr. (1920-2000); Bruce R. Edwards (1926-2003); Amelia Schubert Edwards (1893-1979); and James Henry Edwards (1893-1950). James Henry Edwards (1893-1950) was born in Scotland and came to the United States in 1908. After serving as a Sergeant in WWI with Ambulance Company 129 of the 33rd Division of Chicago, he found employment as a chef at the Grunewald Hotel, now Fairmont, of New Orleans. He met his wife, Amelia Schubert (1893-1979), a native of New Orleans in Dallas. They reared four sons at Ocean Springs: James Henry Edwards Jr. (1920-2000), Donald F. Edwards (1924-1982), Bruce Robert Edwards (1925-2003), and Edgar Wallace (1927-1996). When the Edwards family took over the French Hotel in 1921, there was no electricity. These were the days when people convened in the evening after dinner for conversation. 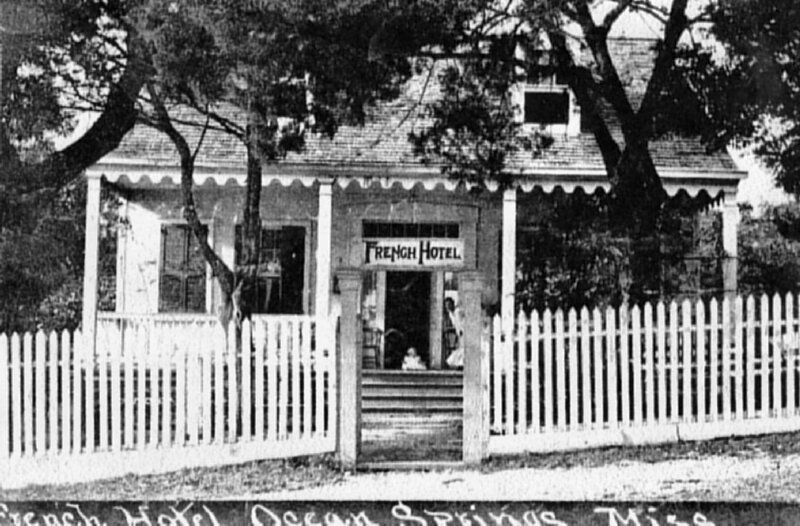 The French Hotel had a 60 square-foot pavilion which encircled an oak tree on the beach around which hotel guests and people of the community would gather and exchange stories. Mr. Edwards was both very industrious and frugal. During the early days of his proprietorship of the French Hotel, he also operated the Plaza Cafe located on the northwest corner of Desoto and Washington. To equip his kitchen, Edwards purchased surplus WWI equipment from the Army camp at Deer Island. Although it had won the reputation as one of the very best restaurants on the Gulf Coast, the Plaza Cafe closed in May 1924. During World War II, Lieutenant Commander J.H. Edwards took a position with the Shipping Administration and crossed the North Atlantic on troopships. He also served as chief steward aboard the very large hospital ship, USS Larkspur. His son, Seaman First Class Donald Edwards, served in the merchant marine. At the time of his death in January 1950, Edwards was the chief steward on the Army transport Short Splice. He died in the Marine Hospital at New Orleans. Edwards anticipated a busy summer season for the French Hotel. He needed additional time to prepare his beach front hostelry for the influx of visitors. Wedding and Dinner Parties a Specialty. Rates reasonable. J.H. Edwards, proprietor. Former Chef of Tortorich's Cafeteria. On July 11, 1936, The Jackson County Times reported that the 4th of July weekend was the largest ever seen along the Mississippi Gulf Coast. 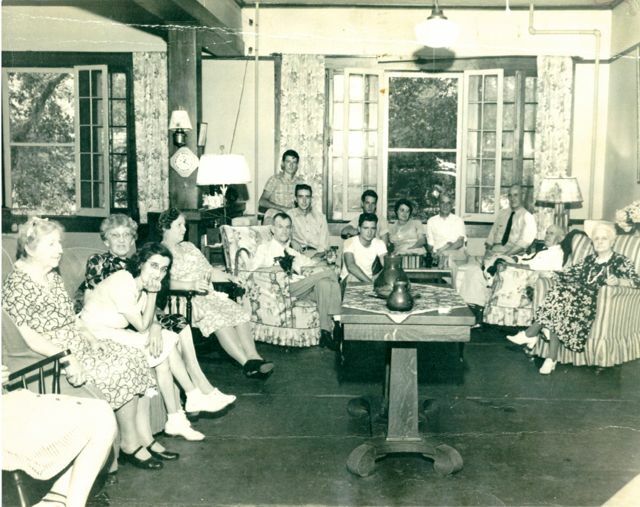 At Ocean Springs tourist activity was particularly busy with the French Hotel and the Eglin House filled to capacity. The Edwards were lauded by the journal for their kindness and concern for the welfare of stranded visitors. This praise was expressed as follows: We wish to commend Mr. and Mrs. J.H. Edwards of the French Hotel for their civic interest in giving personal attention to visitors who come to our city. When their hotel was filled to overflowing Saturday and they were unable to accept any more guests, they went out in their car and assisted the visitors to find rooms in private homes in order that they might remain in Ocean Springs over the weekend and not be forced to go elsewhere. (Local and Personal). Mrs. Edwards was also civically active in other ways. She served faithfully as the local chairperson for the March of Dimes Campaign in the 1940s and 1950s. The hotel also served as the meeting place for the Rotary Club in the 1940s. Their charter meeting dinner was held at the Edwards House. In addition, Mrs. Edwards was a very charitable woman, as she allowed less fortunate, elderly persons to reside in her apartments at very reasonable rates. In the summer-fall of 1997, Troy H. Vincent, proprietor of TVH, a subdivison development company and home builder, erected a Mediterranean style home on the old Edwards property at present day 303 Front Beach. Mr. Vincent also built a fine pier on his riparian rights, which was destroyed by Hurricane Georges in late September 1998. Katrina destroyed the Vincent home. C.E. Schmidt, Ocean Springs French Beachhead, (Lewis Printing Services: Pascagoula-1972), p. 77. Llyod Vogt, New Orleans Houses, A House-Watcher's Guide, (Pelican Publishing Company: Gretna, Louisiana-1985), p. 44. Jerome Lepre, Catholic Church Records of Biloxi, Mississippi, Volume 1, (Catholic Diocese of Biloxi: Biloxi-1991), p. 28. Jackson County Chancery Court Cause No. 6230, “Will of G.W. Vance”. The Daily Herald, "Marie B. Vance Obit", September 1, 1930, p. 2. The Daily Herald, "George W. Vance Obit", February 13, 1940, p. 6. The Daily Herald, "James Henry Edwards Obit", January 11, 1950, p. 8. The Daily Herald, Know Your Coast, "The French Hotel of Ocean Springs" by Ray M. Thompson, 1957. The Jackson County Times, Local News Interest, August 17, 1918. The Jackson County Times, Local and Personal, July 2, 1921. The Jackson County Times, Local and Personal, May 24, 1924. The Jackson County Times, "French Hotel Praised by Members of Rotary Club", January 7, 1928, p. 3. The Jackson County Times, Local and Personal, January 6, 1934. The Jackson County Times, "Jacques Bertuccini Obit", May 1, 1943, p. 1. The Jackson County Times, August 26, 1944, p. 1. The Jackson County Times, “Local and Personal”, January 6, 1945. The Jackson County Times, January 30, 1945, p. 1. 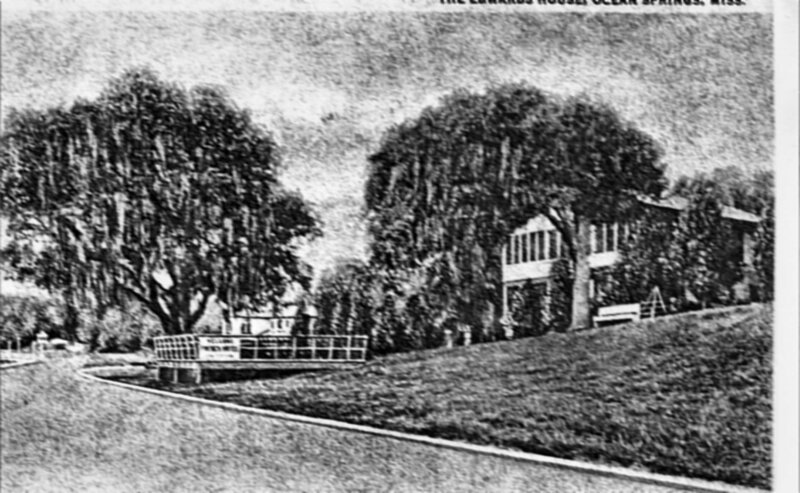 The Ocean Springs Record, “Memoirs of the Edwards Hotel”, April 19, 1979, p. 20. The Progress, Local News, December 24, 1904. US Census - Jackson County, Mississippi 1900, 1910, and 1920. Forrest Lamar Cooper Postal Card Collection-Mississippi Department of Archives and History, "Ocean Springs Book".